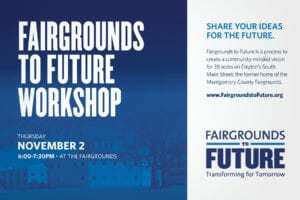 There will be the first of the community input meetings tomorrow night on what to do with the Fairgrounds. It’s nice that Premier (Miami Valley Hospital) and the University of Dayton have decided to involve the community. They’ve hired a planning firm out of Columbus to help with the process. Of course, the last time the County asked for plans for the Fairgrounds and two companies went all out with their ideas- they were tossed aside, and the Fairgrounds got handed to the Meds and Eds neighbors for a song. I’ve been to many of these “community input” type events before. To me, they are kind of like asking a few hundred amateur house painters to get together to do the Mona Lisa. That aside- suppose the Greene wasn’t already in existence, or the Fairfield Commons Mall, or the Dayton Mall area- or Austin Landing, and we were going to build another faux downtown, just South of the real Downtown, what would we have? Another bunch of buildings to compete with the buildings that are already under-utilized. We know MVH needs parking. They’ve been building more and more lots, along S. Main, Warren, etc. They already have a few garages. What they really need is less people driving to work- and they’ve already tried to build housing for their employees- and it still didn’t help, much. The main reason people feel weird about having to live down here is, the only grocery store isn’t very nice. So, sure, you could put a grocery super store on 12 of the acres- but, you could also put a Trader Joe’s on Wyoming where Patterson Kennedy Elementary school sat- and people would be overjoyed. We don’t really need a super-amazing suburban style grocery. So, what do we need? Well, the city said no to a dog park, to a skate board park, and instead built Riverscape with a rink you can’t play hockey in. We’re building yet another concert venue- as if the Fraze and the Rose aren’t enough. We’ve got a mini-white water run, for all 1000 kayakers around. And, UD still has huge parcels of unused land along Stewart street. Including a huge parking lot, a band practice green and some soccer fields and tennis courts. In the meantime, Brown Street has a gazillion chain food options- which get slammed at meal time- and sit idle the rest of the time- esp. in summer when the students are mostly gone. What is needed is some synergy between Brown Street, and whatever we’re going to “plan to build” and yet- they are a big block away. So unless you look at what’s going to happen with the Stewart street corridor- the Fairgrounds remain sort of an island. Maybe, what needs to happen is that all of what sits off Stewart- needs to be tucked away on the Fairgrounds or by UD Arena and Welcome stadium- with a free street car to circle from the Arena to Campus and around the Hospital. Instead of huge parking garages off smaller streets- we just should build a huge one by the highway and the stadiums- and let people take the street car to the developments? Or to work at MVH, or UD? And, at the corner of Brown and Stewart- right next to campus- we build a 5000 seat hockey arena, with 2 sheets of ice, to accommodate all the East coast kids- and the loss of Hara. Along with a second garage there, you solve the problems of Brown Street, plus bring people in for either hockey, or smaller shows than the big arena or the Nutter Center can take. Then at the Fairgrounds- put a dog park, a skate park, a velodrome to add on to our bike friendly city cred. Why can’t we have a big park for year round events? A huge pool, wait, didn’t we used to have one by NCR and Old River? Maybe it’s time to bring one back? Building more shopping, or housing, isn’t really going to add anything to our mix. Solving some of the circulation and entertainment misses in our community could make a huge impact. I’m going to be there- only to ask that we don’t look at the Fairgrounds as an island- because, that’s what it’s been for the last 100 years. It’s time to look at the whole area and figure out what would make Dayton a better place to live. First do a controlled burn the roundhouse rotunda and apply the 2 million to the county to curb the deficient. What happens to the fiery millIon sorry forty million from the sale of fairgrounds? Has that been ultilized to curb the county deficient ?